My precious boy came into my life officially July 18, 2003. I had spent the previous 6 weeks on the phone with the only breeder of repute in my area. In those 6 weeks, I went from an impossibly long waiting list to getting pick of the litter. It was truly a miracle how God's Grace worked this out for us. The previous November, I had major nerve surgery with muscles and bone removed... equivalent to having your arm cut off and reattached. I was not doing well, had become reclusive from the pain and spasms, loss of function. I was so low, in fact, that living didn't seem like something I really wanted to do. Then, came Boone!! I was needed, loved, adored, blessed, forever changed by those whiskies and his 'widdle-widdle O' when he would 'roo!' We went everywhere together, roamed the neighborhoods, met all of our neighbors...I started living again. Wherever we went, Boone would touch others with his consideration and thoughtfulness. Schnauzer owners know...they are very,very kind. There are so many stories I could write, but for now I will close with him being diagnosed with diabetes Feb 09 and passed away Oct 15, 2010 from a mass between his kidney and stomach that is related to the diabetes. I miss my Pal so much! Your Boone was so beautiful. God gave you a wonderful gift to get you through a really bad time, how blessed you are. I am so sorry for your loss, but remember God thought you were good enough to have the care of one of his very precious creatures and he will live forever in your heart. I lost my Gus at age 7 to lymphoma cancer on March 31, 2010 and it was a horrendous loss. 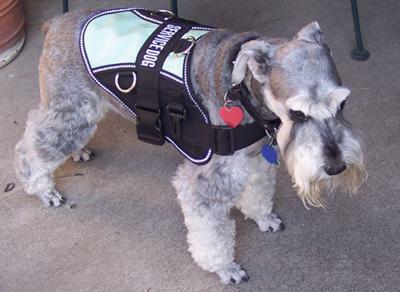 I am so lucky to still have my Max, a year old Miniature Schnauzer--but I cry daily for my Gus. Hang in there! Kitty, I am sooooooooo sorry that you lost your pal Boone. He was such a handsome little guy. I do hope that someday soon you will be able to get another mini to keep you company. He will never replace Boone, but can help to heal the pain in your heart. My heart goes out to you for your loss of Boone. There is no greater pain than the loss of a beloved pet ~ a best friend ~ a family member. For they may be gone ~ but never forgotten.